— Always put baby to sleep ALONE, on his/her BACK, in a safe CRIB for naps and night time sleep. Putting baby down to sleep with adults, other children or animals can cause baby to suffocate. — Place baby in a safety-approved crib, bassinet or portable play area with a firm sleep surface and fitted sheet. Do NOT place baby to sleep on an adult bed or other soft mattress, waterbed, sofa, chair, beanbag, pillow, cushion, other soft surface or in a car seat, sling, swing, bouncer or stroller. — Remove all soft objects toys, blankets, bumper pads, pillows from the baby sleep area. — Dress baby in a sleeper/sleep sack instead of using a blanket or other covering. Do not let baby overheat. — Put baby to sleep alone in a crib or bassinet, but in the same room where you sleep. Bed sharing is dangerous. In 2016, there were 71 unintentional suffocation deaths of children under age one. 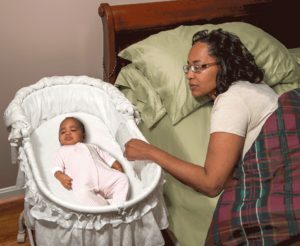 Accidental suffocation and strangulation in bed (ASSB) is the leading cause of infant injury deaths and is directly related to unsafe sleep environments including soft bedding, overlay, wedging, entrapment and strangulation. ASSB is preventable, so EVERYONE needs to know about infant #SafeSleep.